I have to say, one of the coolest things of the Golden Compass movie was the visuals and how awesome the armored polar bears were. (Yes, the books were better, as the movies took all the philosophical bite out. so it goes.) Still the effects and characters were well done and afterwards, I wished for a moment I had a talking armored polar bear friend. 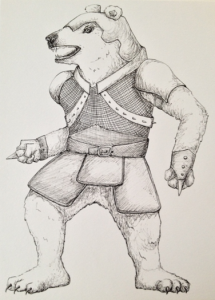 So I was pretty excited when a weightlifter I know, asked me to design an armored polar bear he can print on a shirt and wear to his competitions. I had no idea how I would tackle it. And I have to tell you that my default art setting is ‘cute cat’. So much so, one of my early illustration teachers looked at my worked, told me some people were better off working at cute and I should aim for children’s book illustration. I took that advice and it was a lot of years before I could do something like this bear. I have to give some credit to all those ATCS here. And to some time spent dabbling in replications of old, damaged paintings for people. Stretching out my legs in ATCs and replications, is what made it possible for my to develop this armored bear who is not warm and cuddly and definitely not cute. Taking on the occasional uncomfortable ATC project gave me some skills I thought would remain undeveloped. I’ve always thought training as an illustrator meant you could pretty much do anything; you learn skills in forgery, copying and replication, since you have to give the customer what he wants. The assignment is often similar to something he saw, a tenth generation version of an idea you start with and you often learn new media and techniques to make it happen. Now for the first time in my life, I do actually feel I could do anything artistically and the picture of the awesome idea in my head is translating perfectly to the art.